This detector has now been replaced by the GasAlertMax XT II. 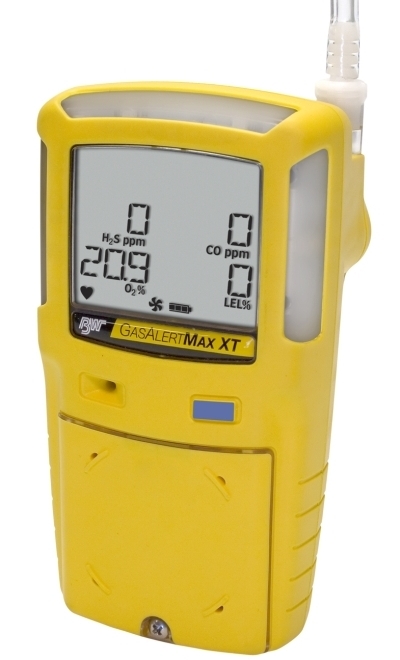 The durable GasAlertMax XT simultaneously monitors and displays up to four gases including hydrogen sulfide (H2S) carbon monoxide (CO), oxygen (O2) and combustibles (%LEL) and combines straightforward one-button field operation with an integrated sampling pump. Tamper-proof, user-adjustable options enable the instrument to be customized to suit your application. Confined space entry and remote sampling have never been so easy with new intelligent pump technology. Minimize pump blockages and improve remote sampling result accuracy. The GasAlertMax XT is fully compatible with the MicroDock II automated test and calibration system.